A man arrested on suspicion of making hoax bomb threats which caused a motorway to be closed will face no action. A coach driver called police after people on board raised concerns about a fellow passenger on the service from Stansted to London. 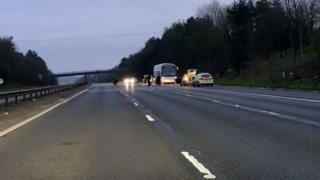 Officers arrived at the scene at about 02:30 GMT on Wednesday and closed part of the M11 in both directions. Essex Police said the 20-year-old man had been released without charge. The motorway, which was closed between junction eight for Stansted and junction seven for the A414, reopened just before 06:30. Assistant Chief Constable Paul Wells praised the actions of the passengers and driver. He said: "We understand the man's behaviour gave cause for concern and the passengers did the right thing by raising this to the driver, who was then able to stop the coach and report this to police."